Applications of Mass Spectrometry Imaging to Cancer, the latest volume in the Advances in Cancer Research provides invaluable information on the exciting and fast-moving field of cancer research. 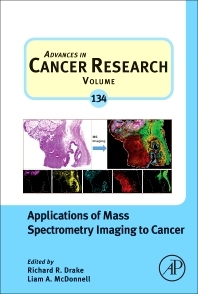 This volume presents original reviews on applications of mass spectrometry imaging to cancer. Dr. Drake is a Professor in the Department of Cell and Molecular Pharmacology and Experimental Therapeutics at the Medical University of South Carolina and SmartState Endowed Chair in Proteomics. He is an experienced protein biochemist and glycobiologist, with particular expertise in tumor biology and biomarker discovery from clinical fluids and tissues related to urological cancers and other cancers. He obtained his Ph.D. in Biochemistry at the University of Kentucky with Boyd Haley, generating multiple nucleotide sugar photoaffinity analogs for use in the study of glycosyltransferases. More extensive glycobiology training was done in post-doctoral work with Alan Elbein, and he began his academic career in Dr. Elbein’s department at the University of Arkansas for Medical Sciences. Currently, his research focus is on direct analysis of glycans and glycolipids in tissues using state-of-the-art MALDI mass spectrometry imaging approaches. Complementary glycopeptide mass spectrometry and metabolic labeling targeted approaches are being done to identify specific glycoproteins involved in the epithelial-to-mesenchymal transition.